The purposes of the D-6-R zone are to permit high-density commercial development in the Downtown core while promoting residential development throughout the zone with residential requirements and incentives. The following Downtown Sub-Areas are found within the D-6-R zone: Downtown Retail Core, Downtown Arts, Pennsylvania Avenue, Chinatown. No taller than the width of the street plus 20 ft (front's on right of way less than 90 ft). The D-6-R zone is not subject to the Inclusionary Zoning provisions of Subtitle C, Chapter 10; however, a building in the D-6-R zone may generate or use credits in accordance with Subtitle I, Chapters 8 and 9, which explains the credit system relating to Transferable Development Rights (“TDR”) or Combined Lot Development (“CLD”) rights. A building on a lot in the D-6-R zone must provide the equivalent of at least 2.0 Floor Area Ratio (“FAR”) of residential use before any non-residential uses may be provided on the lot, unless the development meets one of the exceptions in Subtitle I § 562.2. The permitted FAR and height of a building in the D-6-R zone are based on the right-of-way width of the street upon which it fronts, as detailed in the table below. 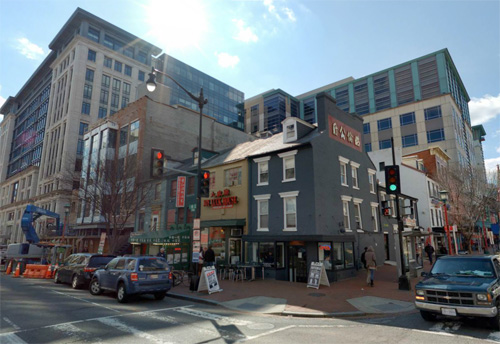 No front setback is required, unless the development is subject to the front setback regulations of Subtitle I § 608 for a building fronting on Pennsylvania Avenue, N.W. or otherwise governed by a regulation referenced in Subtitle I § 608. 1 The maximum permitted density for a building shall be the density achievable within the height and bulk permitted by the zone and any applicable sub-area regulations: (a) If all of the building’s FAR is devoted to residential use; (b) If all FAR exceeding the non-residential density permitted in Subtitle I § 562.5 is devoted to residential use; or (c) If conditions (a) or (b) are not satisfied, through the use of credits provided for by Subtitle I, Chapters 8 and 9. 2 Unless (a) Relieved of a residential requirement by the provisions of Subtitle I §§ 305.3, 562.3, or 562.4; (b) The residential requirement is reduced by up to 0.8 FAR through constructing or financially assisting affordable housing pursuant to Subtitle I § 305.7; or (c) If modified through the credit procedures enabled by Subtitle I, Chapters 8 and 9, subject to the condition in Subtitle I §§ 200.2 and 200.3. Any lot in Square 455 shall be exempt from minimum residential requirements as long as it is occupied by an arena with a valid certificate of occupancy. 3 Subject to applicable regulations governing courts, side or rear yards, front setback or build-to lines, easements or historic preservation. 4 Unless modified in in Subtitle I, Chapter 3 or by regulations governing a specific Downtown sub-area. 5 No parking is required in this zone, but parking spaces provided are subject to Subtitle C, Chapter 7. 6 Unless otherwise governed by a regulation referenced in Subtitle I § 608 for the Pennsylvania Avenue Sub-Area.